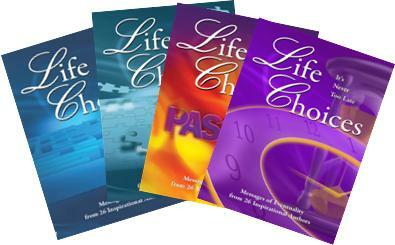 ï»¿ï»¿ Are you facing difficult choices in your life? Are you frustrated and discouraged about the direction your life is taking? Don’t feel you have the skills to make wise choices? TAKE CHARGE NOW! Start your path to a dream life. Join Judi Moreo, myself and 24 other powerful authors/speakers for Life Choices: The Event, a life-affirming weekend at the Tropicana Hotel in Las Vegas. If you don’t have the success in life that you want, it might be because you didn’t choose to have better health, the career of your dreams, a loving relationship, or money in the bank. Perhaps you didn’t realize you even had a choice – or did you decideÂ not to make a choice? FACE IT! Not making a choice is a choice! It’s a choice to fail…to let life take you where it will. It’s a choice to be the passive recipient of whatever comes your way. The life we live is a result of the choices we make. Everything in our lives exists because we made a choice about something. Our choices can be exactly right for us or very, very wrong. They can help us reach our goals or keep us from them. Successful people make conscious choices every day. They make the choices to be in the right place, at the right time, with the right people. They make the choice to model people who have successfully done what it is they want to do. And they take decisive action on the choices they’ve made. Please use PYPSN in speaker code box when registering! Pay $100 deposit now and remainder in installments. Stuck in a situation that seems beyond your control? The Life Choices Event speakers will show you how you can make different choices and change your tomorrows – how to live with purpose every day. Hear how they coped with crisis and uncertainty and made tough choices and positive changes in their lives. Learn how they found deeper meaning and satisfaction in relationships. These speakers are living proof that miracles can and do happen. Choose the life you wish to lead.Â Join us at Life Choices: The Event, March 23 -25, 2012 at the Tropicana Hotel in Las Vegas, Nevada. www.lifechoicesevent.com or call (702) 896-2228 for more information.Â Please useÂ PYPSN in speaker code Â box when registering! BIG THANKS to Judi Moreo and Turning Point Publications for the press release that created this post!